While most product engineers know Plascore honeycomb for its shear strength and high modulus, many value honeycomb for its inherent ability to channel water or airflow. Polycarbonate and aluminum honeycomb help make refrigerators more efficient, lighting more effective and racecars more, well, more like rockets. In the world of stock car racing, aerodynamics is a critical contributor to the winning formula. That’s where AeroDyn Wind Tunnel excels. 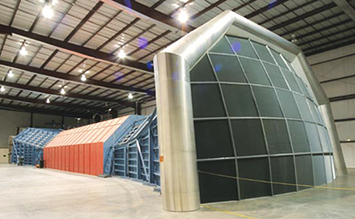 AeroDyn Wind Tunnel was founded in 2001 by long-time automotive engineer and aerodynamicist Gary Eaker. Eaker’s earlier work at GM with NASCAR teams caught the attention of Hendrick Motorsports where he continued to make his mark testing stock car performance for optimal aerodynamics, before launching a top-flight independent wind tunnel. Located in the heart of NASCAR country in Mooresville, NC, AeroDyn Wind Tunnel caters to the best and the brightest NASCAR, Nationwide and Truck race teams who rely on accurate, proprietary data on their vehicle’s configuration as it relates to down force, side force and yaw/pitch/roll moments. AeroDyn is a full-scale, closed-jet wind tunnel optimized for stock-bodied racecars. The tunnel’s 22 individually speed-controlled 100 hp AC electric fans create a 130 mph air flow pushing an incredible 2.2 million cu. ft of air per minute, all flowing through five inches of Plascore aluminum honeycomb. Eaker also uses Plascore honeycomb in his second facility, A2, a wind tunnel marketed to the auto and bike-racing enthusiast. Plascore aluminum honeycomb is the ideal solution in many applications requiring laminar airflow, and calculations are critical in determining honeycomb thickness, cell wall and cell dimension. The result is an efficient medium that yields consistent performance. Anything less is … kind of a drag. For more information visit AeroDyn Wind Tunnel at www.aerodynwindtunnel.com.